The story of how the miraculous fresco of Our Lady of Good Counsel left Albania and traveled to Italy is one that is marvelous and true. There is a little town, about 25 miles outside of Rome, called Genazzano. In pagan times it was a celebrated shrine for the worship of Venus, but in the fourth century a church was built there in honor of Our Lady and called the Church of the Virgin Mother of Good Counsel. Through the course of time the church was abandoned and almost fell into ruins. So it remained until the mid 15th century when a pious woman gave all she had for its restoration. This story is about that pious woman, who in many ways is a symbol for our times. Most of the time her name is lost in the marvel of the facts of the story. She is simply recorded as a pious widow, a tertiary of the Order of St. Augustine, and perhaps she would have it that way. But it seems to me that the story and the miracle of the image of Our Lady of Good Counsel of Genazzano is in a special way her story, and her name should not be lost to history. In 1436 Petruccia Noteria had been left a widow with respectable means. Living alone, for she had no children, she dedicated herself to prayer. Her special concern was the deplorable state of the Church of Our Lady of Good Counsel because she had been favored with a vision in which the Virgin Mary entrusted her with the mission of restoring this church. Petruccia invoked the good will of the townspeople to assist in the work, but they proved unwilling. The strong walls of the small fortressed city had not been able to protect its inhabitants from the spirit of the Renaissance, with its love of luxury and comfort, from corrupting the customs and vanquishing the faith of its inhabitants. Convinced of her mission and confident that Our Lady would provide the means for her to accomplish what had been asked of her, Petruccia donated all her goods to pay for the restoration of the sacred building with the hope that others would join her in the pious undertaking as they saw it being realized. The most courageous part of her story commences now. Many a person indeed has taken on noble enterprises and has been willing to make great sacrifices, offer their goods and even suffer death for the greater glory of God and the exaltation of the Holy Church. But then, before the laughter of their peers, for fear of meeting a condoning smile or a sarcastic word, the heroic resolution collapses. And why? For fear of a laugh. For fear of the laughter of a serving woman, St. Peter denied Our Lord. How many more denials have been made so that we can adapt to a public opinion that does not censure us — or fall into a life of being “normal” and “fitting in”? Every year on April 25, the feast day of St. Mark, Genazzano’s patron, a fair was celebrated in the city square, where the partially restored church of the Mother of Good Counsel stood. But something quite unusual took place in the year 1467 that would mark the day and the little Italian village in History. As the fair began to draw to a close and the hour of Vespers approached, a white luminous cloud drifted down over the village. From it the chords of a beautiful music seemed to emanate. The cloud descended on the church of the Mother of Good Counsel and poised over the wall of the unfinished chapel of St. Biagio that Petruccia had raised. Promptly Our Lady began to show her generosity. The innumerable cures and consolations she dispensed have been documented by the local ecclesiastical authorities. Almost overnight, the funds poured in to complete Petruccia’s work and the church was completely restored. The former Chapel of St. Biagio became a very rich shrine to harbor this gift from Heaven, which for five centuries to this day has remained miraculously suspended in the air close to the wall of the chapel. 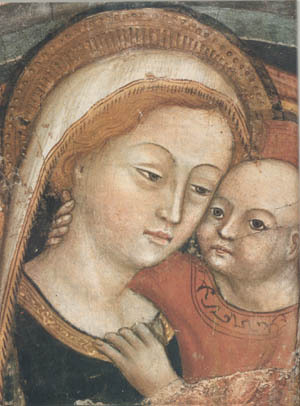 The fresco became known as Our Lady of Good Counsel of Genazzano, sometimes simply called Our Lady of Genazzano, in honor of the town in which Our Lady herself chose to find refuge. The faith and piety of the people of the whole town was regenerated. Before long, as news of the story and the miracles and wonders Our Lady was working spread, pilgrims were coming from throughout the province and beyond. Processions of whole villages traveled to venerate the miraculous image. It was not long before Our Lady chose to reveal to the townspeople how “Mary from Paradise” had come to rest on the half-built wall of the church Petruccia was determined to restore. This particular fresco, reputed to date to the time of the Apostles, had long been venerated in Albania’s capital city, Scutari. The Turkish army had invaded Albania and was then threatening to take the capital. Our Lady assured two of her devoted and inconsolable servants, Giorgio and de Sclavis, that her picture would not be desecrated and ordered them to prepare for a journey and to accompany the fresco wherever it might go. The picture detached itself from the wall, and the two friends followed the fresco, which was wrapped in a white translucent cloud, to the coast of the Adriatic sea. 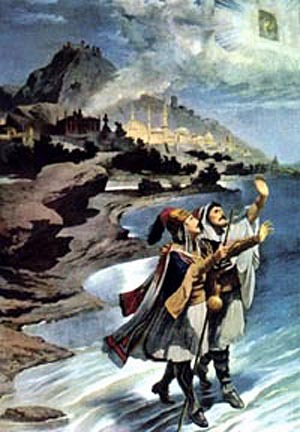 Then the faithful Giorgio and de Sclavis continued to follow it across the Adriatic, walking miraculously on the water, until they reached Italy. Having reached Italy, the image suddenly disappeared from their sight. It had gone to find refuge in the half-built church of a woman of faith, Petruccia. It had gone to Genazzano. Because of Petruccia’s confidence in Our Lady’s promise, much more than a single church was rebuilt and restored. This incident is remindful of Christ’s command to St. Francis to “rebuild his Church,” St. Francis assumed he was referring to the little church of St. Damien, which was in ruins. It was only much later that St. Francis understood that the House he was to rebuild was the Church established by Our Lord upon Peter. Our Lady’s command to Petruccia was more than to rebuild a single dilapidated church; it was her design to rekindle and revive the faith and piety of a whole province and beyond - at a time when the Faith was under attack by the internal enemies of Humanism and indifferentism. In the twentieth century, Our Lady appeared at Fatima with a warning of a coming chastisement if mankind did not convert and if Russia were not consecrated to her by the Holy Father in union with all the bishops simultaneously in their respective dioceses. She also gave to the faithful a message of hope – an eventual victory. Can we doubt that we are not also invited, like the simple Italian widow, to the task of rebuilding the House of Our Lord? It is not difficult to see in the miracle of Genazzano many similarities to our times. Then, a world was falling victim to a great moral and religious crisis; the churches were being invaded by a terrible enemy [the Turks entering Albania]; and two faithful soldiers and a brave widow who “against hope believed in hope” (Rom 4:18). 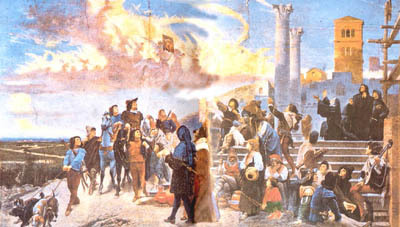 Today, the moral and religious crisis reaches almost incomprehensible depths; an invasion of the Church is coming from within her own walls and appears to have worked almost a total destruction; yet, here and there, there are those faithful souls who build their chapels and combat the moral laxity, confiding in the promise that Our Lady gave at Fatima of a triumph, a restoration. Here and there, there are those courageous souls who do not fear to brave public opinion, openly profess their faith and oppose the Conciliar and post Conciliar abuses inside the Church that have been fostered among the highest echelons of ecclesiastical authority. Here and there, the half-finished walls of the church rise as people gather to assist at the Traditional Latin Mass and keep alive the abandoned pious devotions. One of great graces one finds at the feet of Our Lady of Genazzano and from the example of the noble Petruccia is that of confidence. If we have the courage to pray and act with confidence for great or impossible things, great and impossible things will be given us. God never refuses confident prayers, and bestows his gifts in proportion to our confidence. Today, as Our Lady warned at Fatima, we face an immense crisis that demands a supernatural solution. Yet those who confide in the great promise Our Lady gave, a promise of triumph and victory, should expect to see, like Petruccia, the fulfillment of that promise and to live and see at least the first days of that glorious Marian era predicted by St. Louis Marie Grignion de Montfort, the great prophet of the Reign of Mary.